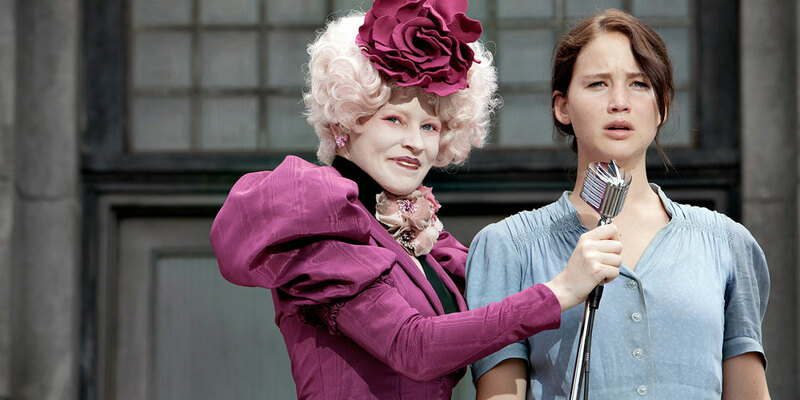 It took me a while to remember what it was that the visual style of The Hunger Games reminded me of. It was a second-hand paperback of H. G. Wells’s The Shape of Things to Come published some time in the 70s which, as these books usually do, featured a cover illustration which drew a little on the book itself and a lot on the trends in SF illustration of the time. That’s an appropriate style for the film, I think, a re-creation of 70s interpretations of WWII-era futurism, or, a taking-up of the science-fictional imaginations from two previous eras of austerity. And the film does look marvelous, with lots of little touches (some of which, such as the train we see near the beginning of the film, might be lost on an audience that doesn’t remember the existence of British Rail) that position it critically within the aesthetics of austerity nostalgia. What makes the film’s use of the aesthetics of austerity nostalgia critical, I think, is the way it combines this with some very 21st-century concerns with biopolitics, financialization, the society of control, and surplus population. 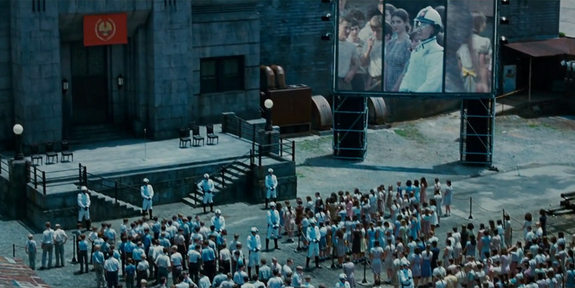 The whole idea of the Hunger Games, ritualized teenage murder as social bonding mechanism, is fairly biopolitical in itself, particularly as the film ties this stark example of control over life to the wider structure of its imagined society. Part of this concerns debt and financialization; the poor can borrow money to buy food against the “collateral” of an increased chance of being picked to take part in the Games, while the rich can bet on and influence the Games by sponsoring their favorite participants. Biopolitical control also shows up in the treatment of the contestants in the Games, which stretches out to include those potential contestants, i.e., all young people who find their adolescence monitored and administered. Maybe most interesting, but also somewhat ambiguous, is the relationship between the Games and the biopolitics of surplus population. The general way the world of the film is described, with the country divided into districts which are each tasked to produce some class of goods, suggests an image of capitalism as exploiting through the extraction of productive labor. 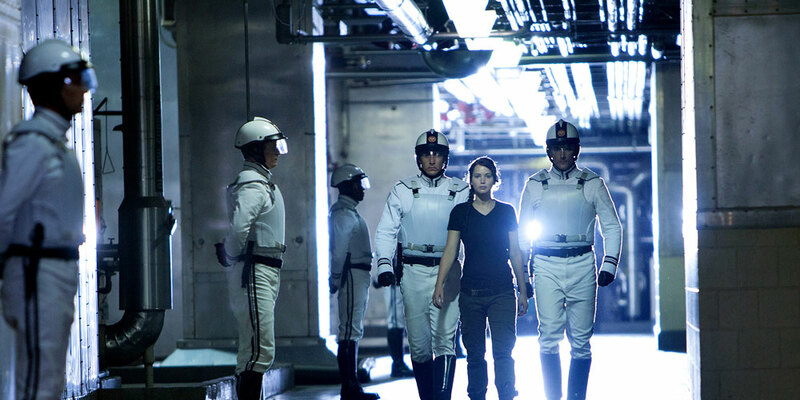 However, we see almost no actual productive labor in the film (the one exception, I think, is a brief scene of Katniss’s father working as a miner), and the early scenes set in Katniss’s home district seem much more like an informal economy exploited by capital in the mode of exclusion, with its barter and gift economies of whatever leftovers can be poached or scavenged. Another way in which the 70s influence is felt in the film is in the striking strand of second-wave feminism that runs through it (well, I thought it was striking, but I spent the day prior to watching the film reading the feminist genealogy in Janet Halley’s Split Decisions, so maybe I was just primed to look at things in these terms). We see this at the beginning of the film, when Katniss is instructed to wear a dress for the ceremony which precedes the Hunger Games, in the fact that one of the biopolitical indignities she suffers in preparation for the Games is having her legs waxed, and in her unwillingness to perform a pleasing femininity in order to win supporters in the Games; all places, that is, where the film emphasizes the social construction of the feminine. I write “social construction of the feminine” rather than “social construction of gender” advisedly, because unfortunately the film also repeats a problematic gesture of some second-wave feminisms, which expressed a hostility to the imposition of compulsory femininity in a hostility to femininity as such, which can reinforce a traditional misogynistic trope in which women are criticized for inauthenticity and artifice. The evilness of Katniss’s main antagonists within the Games themselves, for instance, is demonstrated by their willingness to wear pretty dresses, which marks them as “mean girls.” More generally, the decedance of the Capitol (which runs the Games), as opposed to the virtue of the Districts from which Katniss comes, takes the visual form of feminization, in pink clothes and elaborate make-up. On the other hand, though, the film ends with Katniss, now a winner of the Hunger Games, wearing a pretty dress herself, and her greatest ally throughout the films is her stylist, who teaches her how to use dress and performance to her advantage, so perhaps we will see further dialectical developments of this theme in the subsequent films. …but communicative capitalism is interested in you.